Iron deficiency anemia happens when there is not enough iron in your blood. Iron is a mineral that is important to all body cells. Your blood cells need iron to make hemoglobin. Hemoglobin is the protein in red blood cells that carries oxygen to body tissues. Loss of iron due to pregnancy or bleeding. For example, women lose iron in the blood during their menstrual periods. Another cause of blood and iron loss may be an injury, or internal bleeding in your stomach or intestines. Your healthcare provider will ask about your symptoms and medical history and examine you. You will have blood tests to check for possible causes. If your provider suspects internal bleeding, you may have lab tests to check for blood in your bowel movements, or other tests of your stomach and intestines. You may need to change your diet so that you get more iron from the food you eat. Meat, fish, and poultry are good sources of dietary iron. It is also present in liver, eggs, green leafy vegetables, nuts, peas, beans, and wholegrain bread. A wellbalanced diet contains enough iron for your daily needs. Your healthcare provider may refer you to a dietitian for advice. Iron supplements can be prescribed that will build up your body stores of iron. Iron tablets may have side effects such as stomach cramps, nausea, constipation, and dark stools. To lessen side effects, your healthcare provider will start you on a low dose of iron and slowly increase your dose. He or she may suggest that you take vitamin C with the iron pills to help your body absorb the iron. Taking the iron at mealtimes can help prevent stomach and intestinal upset. Do not take antacids and do not eat or drink any dairy products at the same time you take the iron pills. Antacids and dairy products keep your body from absorbing iron. If changes to your diet or taking supplements do not raise your iron level enough, your provider may give you injections of iron. The symptoms will respond quickly to treatment and improve in just a few days. If you have a bleeding problem, treating the cause of bleeding may also treat the anemia. deep breathing exercises when you feel stressed. How can I help prevent iron deficiency anemia? 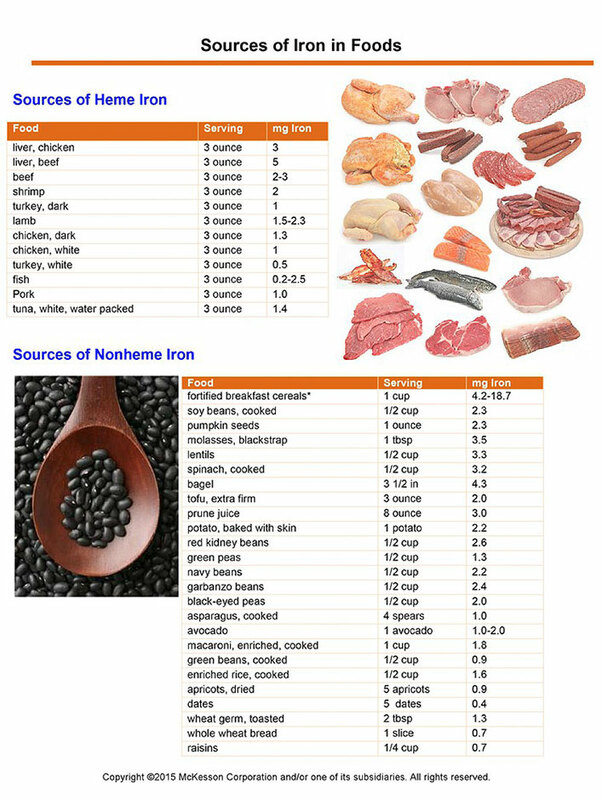 Eating foods rich in iron can help prevent irondeficiency anemia. If you have already had iron deficiency anemia, ask your healthcare provider if you should take iron supplements to keep the anemia from coming back. Do not take iron supplements unless your healthcare provider approves. It is possible to take too much iron. Men need 8 mg a day. Men and women over age 50 need about 8 mg a day. Women 19 to 50 years old need 18 milligrams (mg) of iron per day. Women of childbearing age need twice as much iron in their diet as older women because they lose blood during menstruation. Pregnant women need extra iron for the development of the baby, so 27 mg a day is recommended for them. Most prenatal vitamin pills contain the extra iron that a pregnant woman needs. McKesson Corporation and/or one of its subsidiaries. All rights reserved.